This Christmas, I gave myself a gift. The first part was to really, truly take four full days away from work. No email, no phone calls, barely a thought of the office. Sure two of those days were a weekend, but if I’m being honest, it’s rare that I even go a whole weekend without doing a little something for the magazine, so this really felt indulgent for me. The second part of that gift was to spend much of that time printing. I had a few things I had to get done for Driftless Studio—a beautiful store on State Street in Madison owned by a talented photographer, writer and wonderful person named Anne. 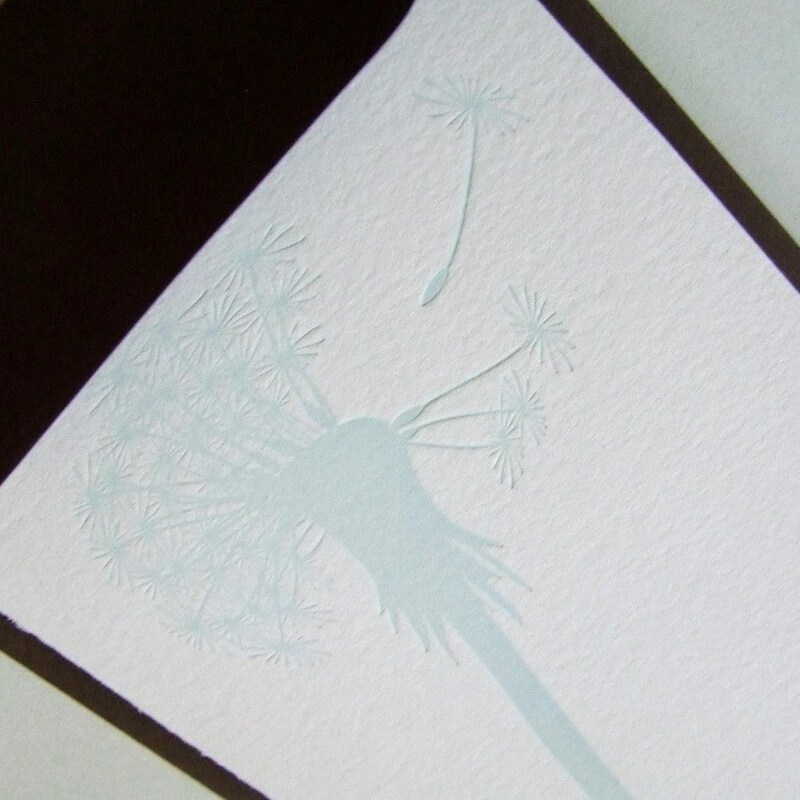 Her favorite design is my “Gone to Seed” dandelion print, so I printed up a bunch of those in light blue, plus some Happy Birthday bike cards, some blue and green grasses, love you. cards for Valentine’s and more. Since the process of inking up, setting the plate and cleaning up is so labor intensive, I tend to print several different designs while I have a color on press. 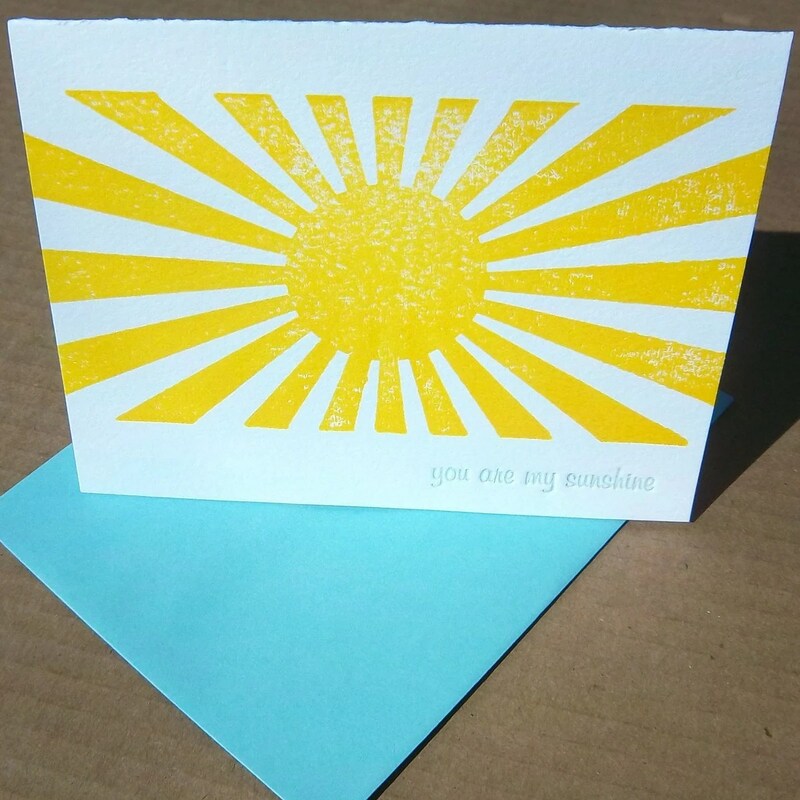 So while I was at blue and yellow, I also did a reprint of one of my fastest-selling designs that I’ve been out of for a while, “you are my sunshine.” I also did a run of a new “congrats” card that would work perfectly for a wedding or new home, plus started lots of recipe cards, limited edition prints and more. Christmas 101: Wrap it up! Merry Christmas Eve eve! My shopping is done—more importantly my crazy work week is done—and I’m finally getting into the holiday spirit. This year instead of spending even more money on gift wrap, bags and bows, I thought I’d use what I already have on hand to make my gifts extra special. I love kraft paper. 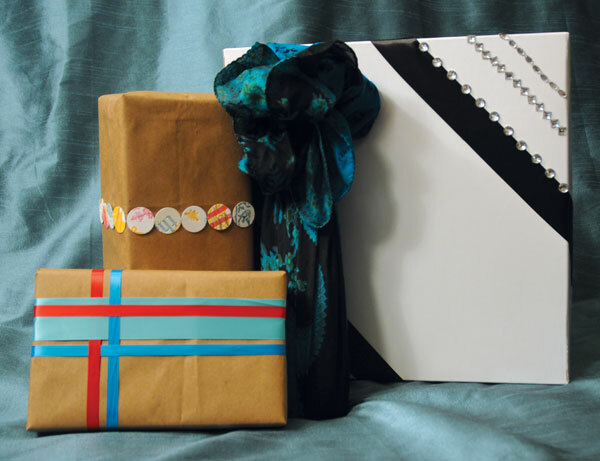 I’ve used it for envelopes, limited edition prints, and this year I decided to use it to wrap several of my gifts. I grabbed a couple grocery bags from my recycling pile and voila! The perfect blank canvas for all your creative endeavors. 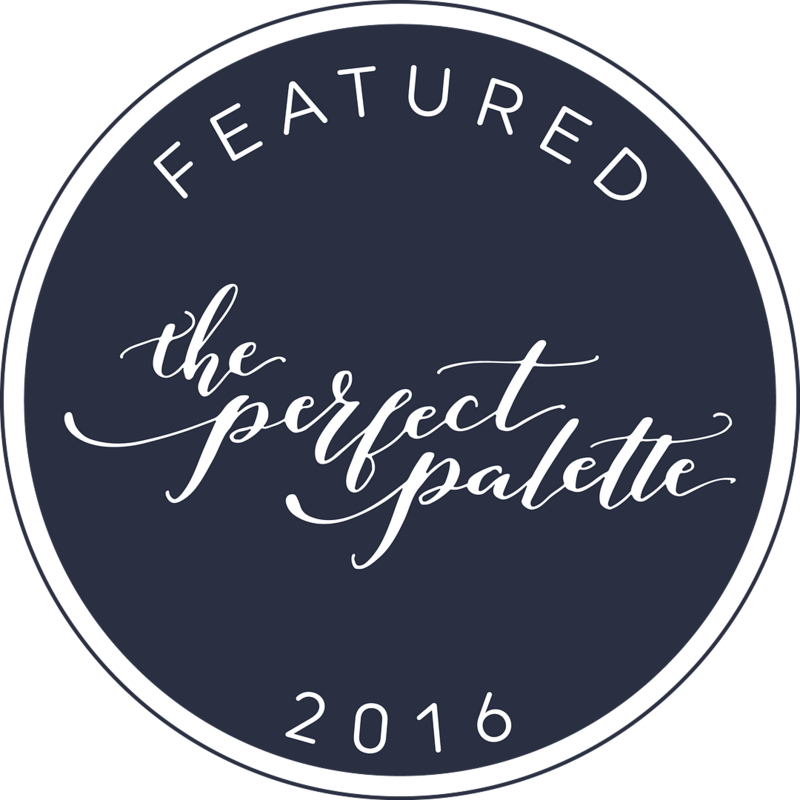 You’ll notice my palette isn’t exactly traditional: I love to work in blues and other jewel tones to make a modern holiday scheme. On any patterned wrap, my letterpress circle garland would get lost, but against a simple grocery bag background, it really pops. So easy to do, yet it’s really all you need! Then I tried a great ribbon plaid wrap I’d seen online. It looks complicated, but it’s really just a matter of weaving your ribbons over and under each other and taping them to the back of the box. If you’re more of a bow person, find a great tutorial here to make your own with all those scraps of fabric you might have lying around. Next: the perfect solution for those oddly shaped gifts. I gathered a silk scarf around the top of this wine bottle—creating a gift that’s twofold, since the receiver can wear the scarf! That big white box is the standard gift box you get when making purchases from any department store. I decided to glam it up with black satin ribbon on each corner, and accented the top one with some plastic rhinestones I’ve had in my craft bin for years. Here’s wishing you and yours a fantastic holiday season. I didn’t quite make my blogging goal this month, but I hope you’ve enjoyed what I have been able to post for you! I’m heading out this afternoon to spend time with family, relax and do a lot of printing, so I’ll see you in 2012! Well kids, we’re getting down to the wire. Relatives are bound to start showing up any minute now, and—oh what’s that? You’re still not ready? Here are a few last minute ideas to get your home in the holiday spirit! The best part? You already have a materials and can pull them off in 10 minutes or less. Enjoy! This first one is pretty darn brilliant, even if it does come from Rachel Ray Magazine. Take any piece of clear stemware—wine or martini glass, even a champagne flute—and invert it over some festive foliage: Holly branches, a poinsettia, even a bough from your Christmas tree, whatever you’ve got around. Place a small votive on the base (which is now the top) or each one and voila! A perfectly modern centerpiece. You’ve got an extra strand of lights or two, right? Why not bring them inside, wrap them around… anything really (seriously: A spray-painted hula hoop, an old frame, a large embroidery hoop… the list goes on) and you’ve got a fancy festive chandelier that easily comes down when your guests go home—or you could definitely leave it up year round! I have a love/hate relationship with Pinterest. On one hand, browsing through it can generate all kinds of creative ideas and break you out of a rut. On the other, it can also create a Facebook-esque time warp and suddenly hours have been wasted clicking through information you don’t really care about. Either way, I thought I’d round up a few of my favorite ideas here! Are you on Pinterest? What do you think? Leave your screen name here to be followed! Follow me at pinterest.com/622press. Let’s be honest, if you’re reading this blog you’re probably pretty darn crafty and you’re thinking about making some of your gifts yourself. Here are a few great ideas and tutorials to get you started! First up: for your dad, uncle, brother or husband, a tie is always a great choice. But why not put a little extra love into this standard gift by making it yourself? Easy instructions are available at the Purl bee blog. 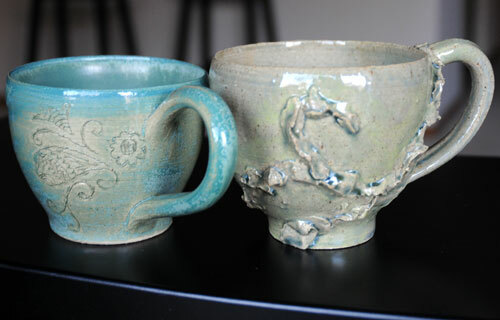 I’ve been spending some time at Higher Fire, a local ceramics studio, throwing mugs and bowls of all sizes. Most towns have a studio that offers this type of thing—or classes if you’re just starting out. If you’re not feeling ambitious or clay isn’t your thing, check out your local paint your own pottery place. A few years ago, my sisters bought me a necklace pretty similar to the one above. 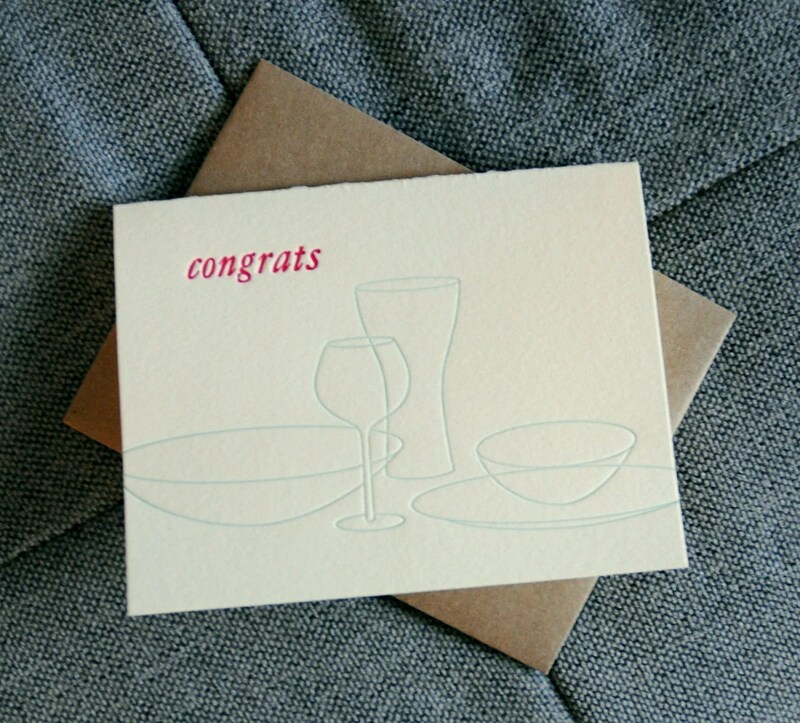 Now, the Bayside Bride blog offers easy instructions for how to make it! The simplicity and clean lines of minimalist décor can certainly make a statement, but for the holidays why not turn up the volume with a little color? I love creating a palette beyond the expected red and green to include light blues, jewel tones and lots of metallics. There’s something wonderful about being greeted by a wreath on a friend’s front door. 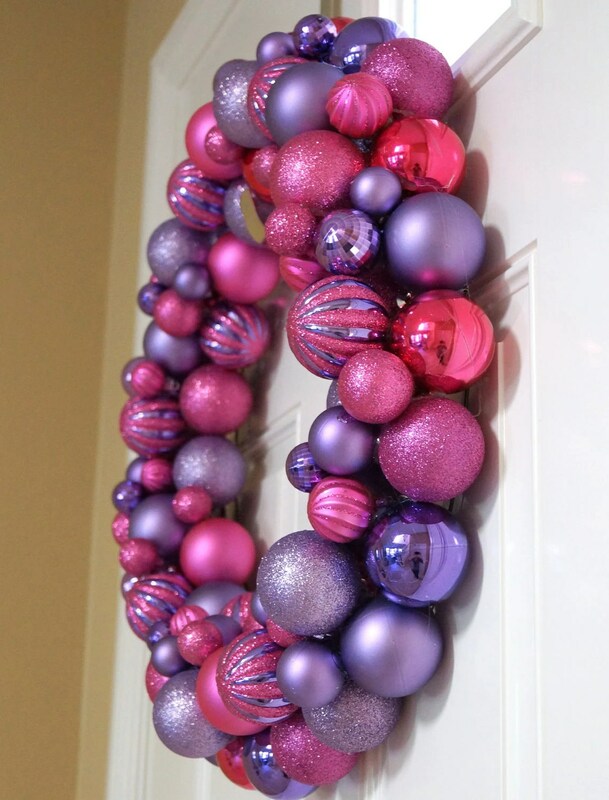 This one is available here, or make your own with shatter-proof plastic ornaments and a hot glue gun. These three-dimensional felt ornaments—which could also certainly be made from colorful paper—are interesting from every angle and look incredibly complicated. However, with a few simple cuts and a couple dots of glue, they seem to simply pop up from a flat pane! Instructions are available here. I love the idea of hanging ornaments off the tree: In front of a window, from a light fixture, from the ceiling over your dining room table. 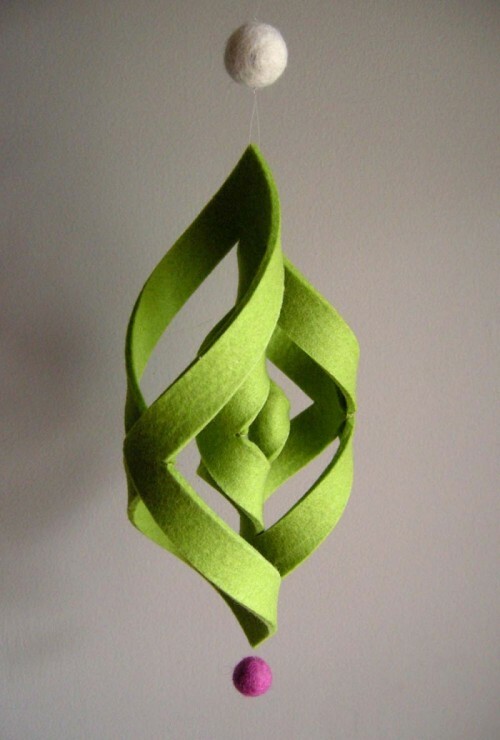 The paper option above is super easy to make, instructions available here or here! 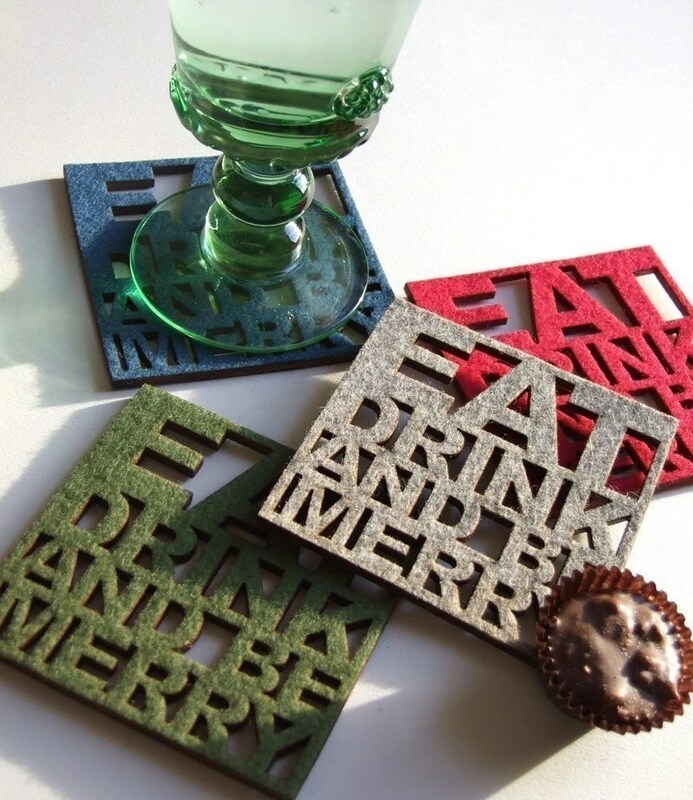 Easily worked into any theme, these laser-cut coasters are the latest addition to my own Christmas list! Love the phrase, love typography, love the felt! Beyond stringing up a row of lights, it’s easy to forget about decorating the exterior of your home. These colored “glass” balls—dreamed up by Hurrayic—make for a fun pop against white snow and a great project to get your kids off the couch. Hello, my name is Kristin and I am addicted to bird-themed accessories. There’s a 12 step program for this, right? First step, admitting you have a problem. Truth be told, I have no less than two feather necklaces, one bird necklace, two pairs of feather earrings, a feather ring and a feather bracelet sitting on my dresser right now. Oh, and a feather-print dress in my closet. So anyway, I see no reason not to continue the theme! We’ll start with something practical. 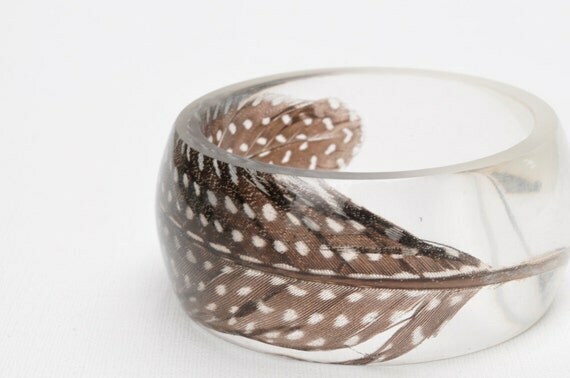 This transparent resin bracelet by Rosella Resin features a polka dot feather from a spotted guinea fowl. 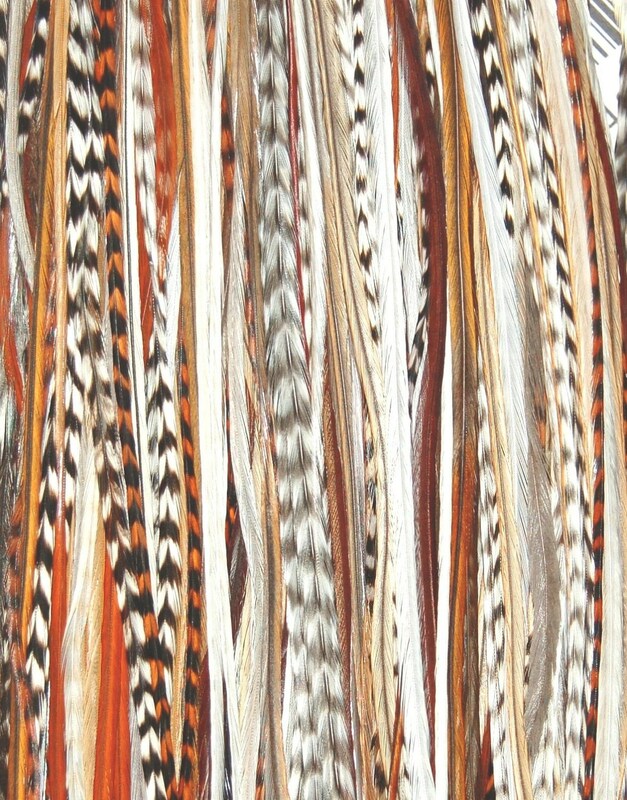 It’s graphic enough to spice up any simple, modern ensemble, yet earthy enough to appeal to a granola girl as well. Now for something a little more fanciful—amazing feather headpieces by Arturo Rios. I know hats are just starting to catch on over here in the U.S., but these are really just too beautiful to pass up. If you can’t imagine placing them on your head, what about on a table as your centerpiece or affixed to a light fixture in your home? Feather hair extensions were very trendy this summer, but I think they’ll stick around for a couple more months. Many shops on etsy offer them, including this set from futska. I love the look, but I’m still trying to decide if they’re worth it! Luckily, these are so affordable it’s worth the gamble.